On 6th March 2017, in occasion of the European Day of the Righteous, the Garden of Lamezia Terme has been inaugurated in honor of those who fought in the past and those who are fighting in the present in order to stop genocides, injustice and crimes against humanity. 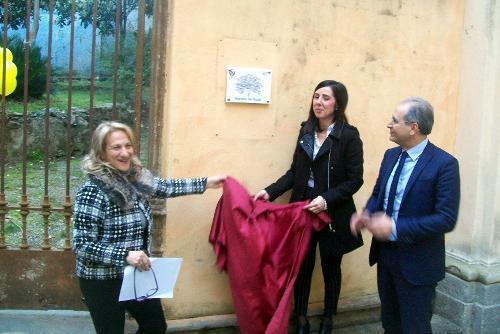 The Garden, located inside Palazzo Nicotera, is the result of a project that was deeply pursued by equal opportunities councillor Graziella Astorino. On the entrance of the Garden there are a plaque and a painting of the Tree of the Righteous. Astorino, the mayor Paolo Mascaro and the urban decorum councillor Elisa Gullo attended the ceremony. In addition, the author of a book on Natuzza Evolo Giusy Starapoli Colafati and martial arts instructor Enzo Failla have taken part of the inauguration and have spoken about the significance of being a Righteous in a world in a disperate need for Justice.